Whoa, where did the summer go? I’ve been a bit behind the eight ball the last little bit, so we will do a double header What I Wore post. Also, I need a little extra content to pull from… It has been way too hot to wear a tie for most of the summer, and I’ve been going pretty casual. Linen button-downs, chinos and loafers. I did manage a jacket on occasion, and even a tie once or twice. So here are some of my favs from June and July. The colours of this outfit worked together, with good balance of contrast and saturation. 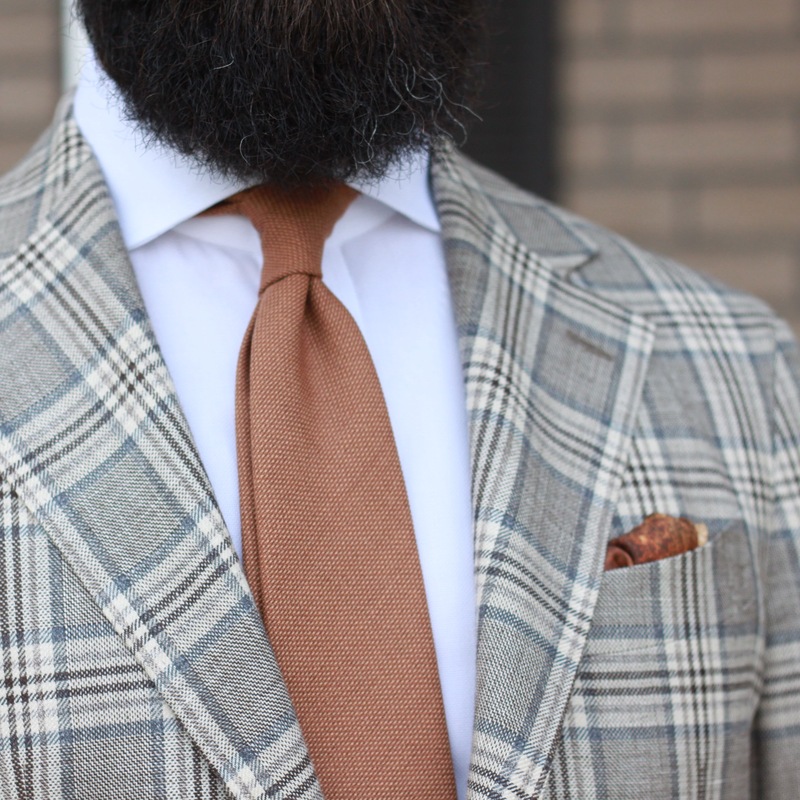 Brown trousers, tan herringbone jacket and a denim blue shirt were the perfect base for this tie from Vecchio Anseatico. It’s from their summer collection, but is going to be used year-round. I am especially looking forward to wearing it in the fall with some tweed. Dark brown shoes and my Great Wave pocket square finished off the look. Simplicity works well. There were a couple of things I challenged myself to do with this outfit. Aside from the pic being overexposed, I really liked how this came out. 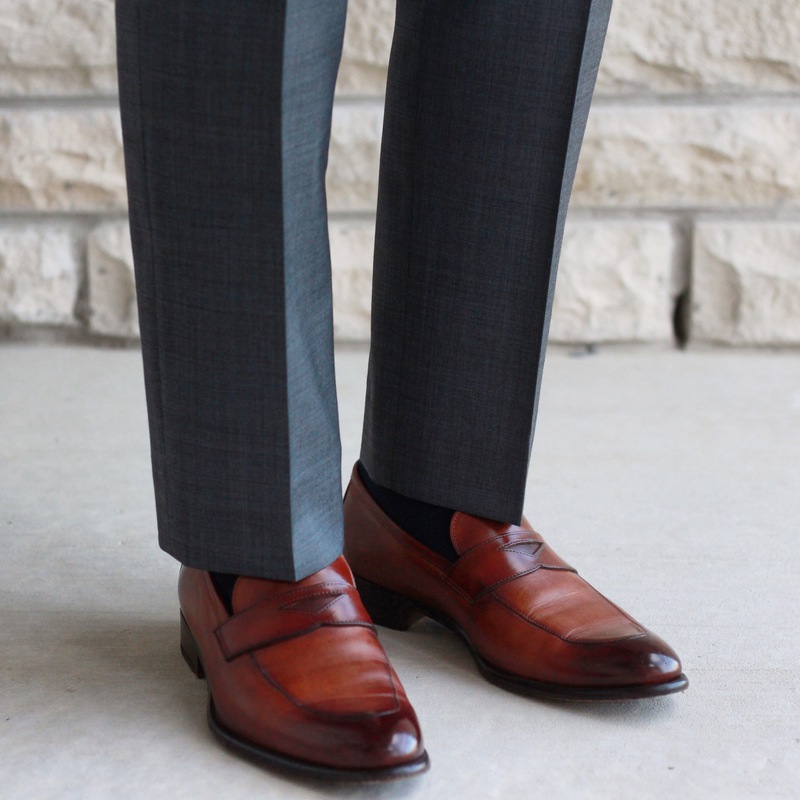 The dark brown suede shoes don’t stand out, but do help to ground the outfit. 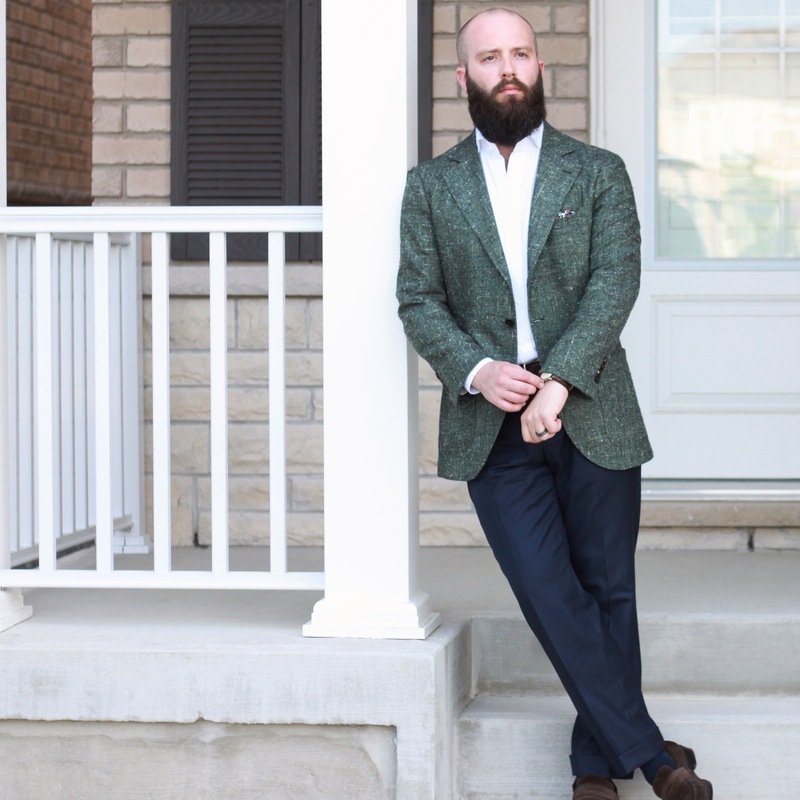 The green slubby sport coat is actually pretty light and breathable, considering it is from the Fall/Winter collection. The variation in colours is amplified by the texture, and it works wonderfully in casual context. It is light enough that it contrasts well with the navy trousers, and saturated enough to also contrast the white shirt. Overall, I would say I succeeded in what I set out to do on all three counts! I also chose my R Culturi mosaic pocket square – I think the navy and white base, with the hints of reddish pink added just a little something interesting to the otherwise solid looking outfit. I know what you’re thinking… I just saw this basic outfit at the top of this post! Pretty similar in terms of colours, and contrast. I almost didn’t include it in here because of the similarity. 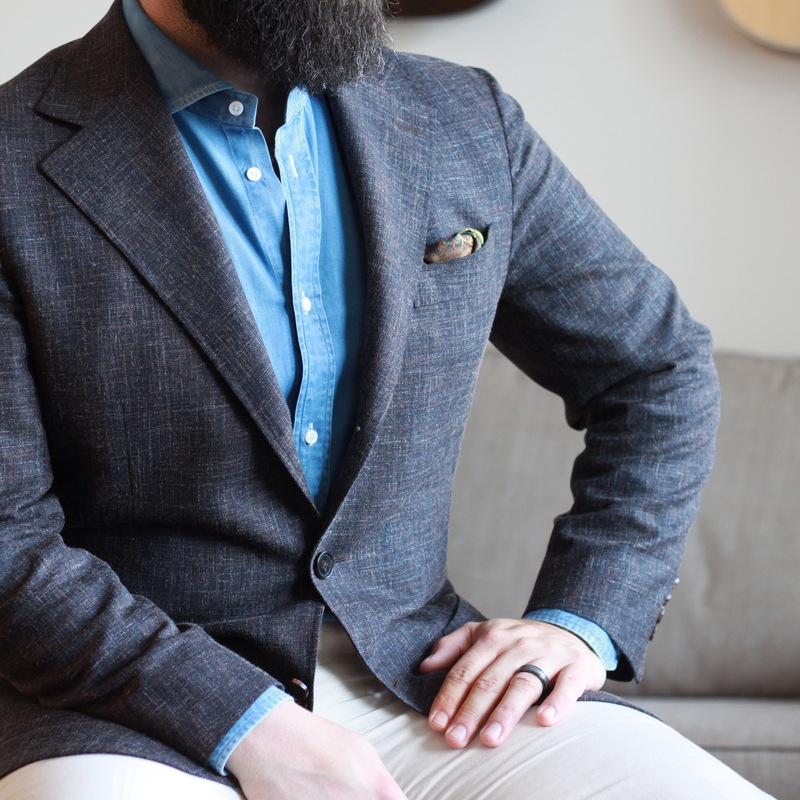 This jacket was a thrift find – a beautiful Pal Zileri Collezione that has sat in my closet for over a year without being worn. I was undecided on how versatile it was, and because it required some alterations. The sleeves feature functioning buttonholes, and were almost 2″ too long. Finally, I’d decided to commit to it and have the sleeves taken in at the shoulder. The sleeve head needs to be pulled in a bit more to help with the drape (there are slight divots), but overall I’m happy. The fabric features a thin olive stripe over a cream base, and is a lightweight wool. The jacket features triple patch pockets, butterfly lining and caramel brown corozo buttons. Lots of details to love. 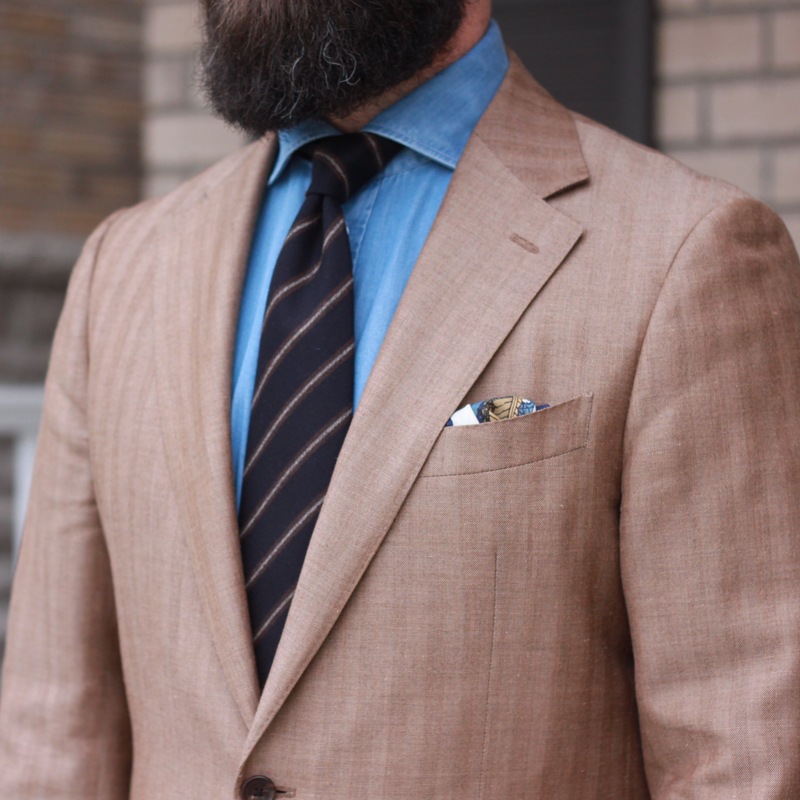 It pairs well with the brown trousers, chambray shirt and this Vanda tie, which is almost the same as the Vechhio Anseatio tie with the colours reversed. I chose the pocket square from Suit Supply via LuxeSwap to pull the darker browns and the caramel colour from the buttons. I’ll be working on figuring out some additional trouser pairing options with this jacket moving forward. 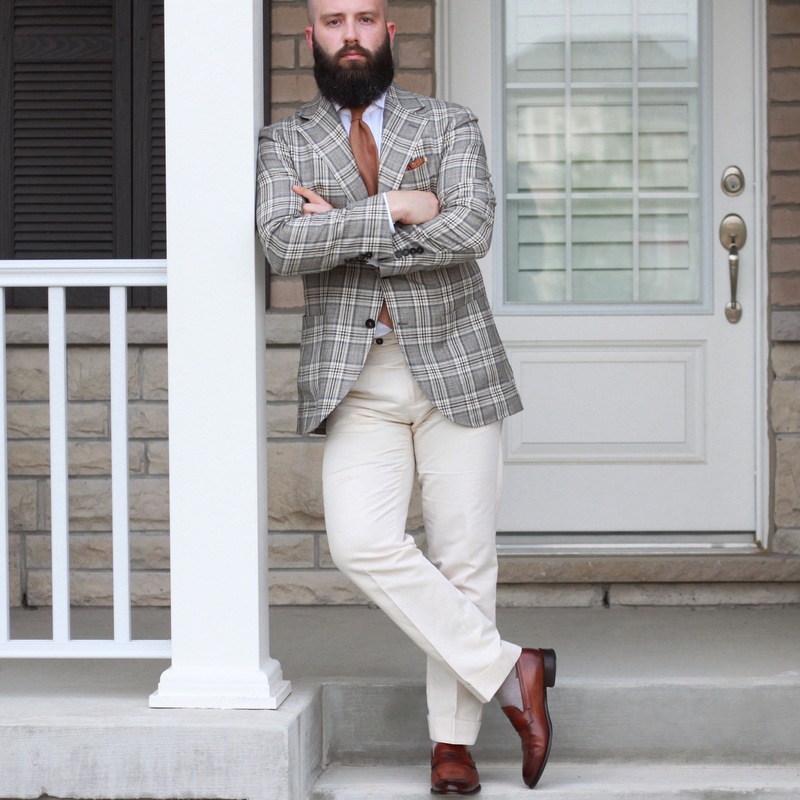 Pairing this light grey and brown checked sport coat with the cream cotton-linen trousers is a no brainer. Light blue shirt? Perfect. 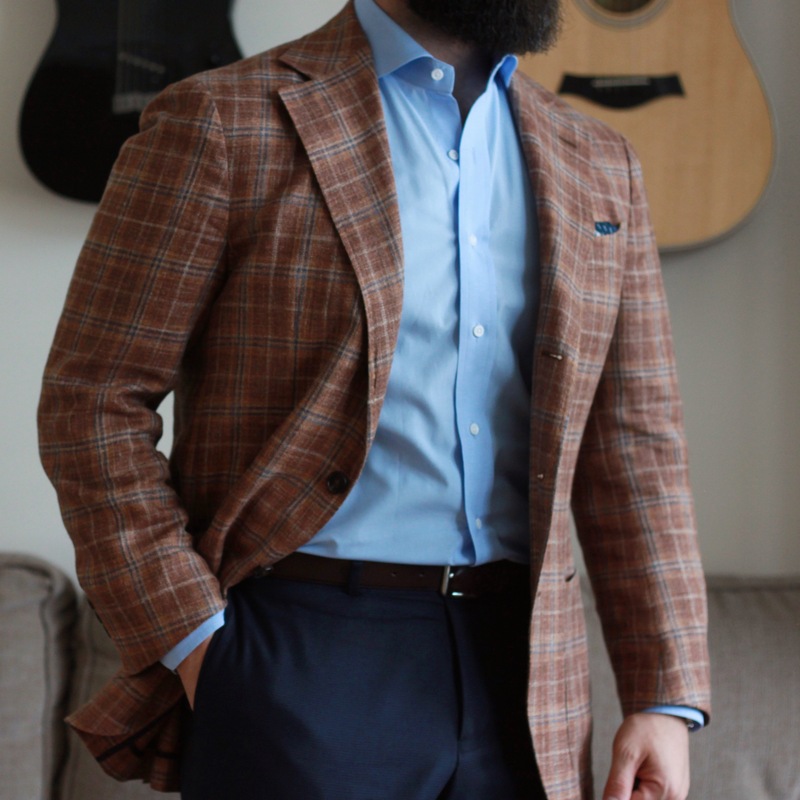 I grabbed my granola hopsack tie from Vanda on a whim, and ended up being really impressed with how well it paired with the jacket. The pocket square, my limited edition Master Shoemaker (also from Vanda) might come across a bit too well matched to the tie in colour, but I think it is a very nice pairing. 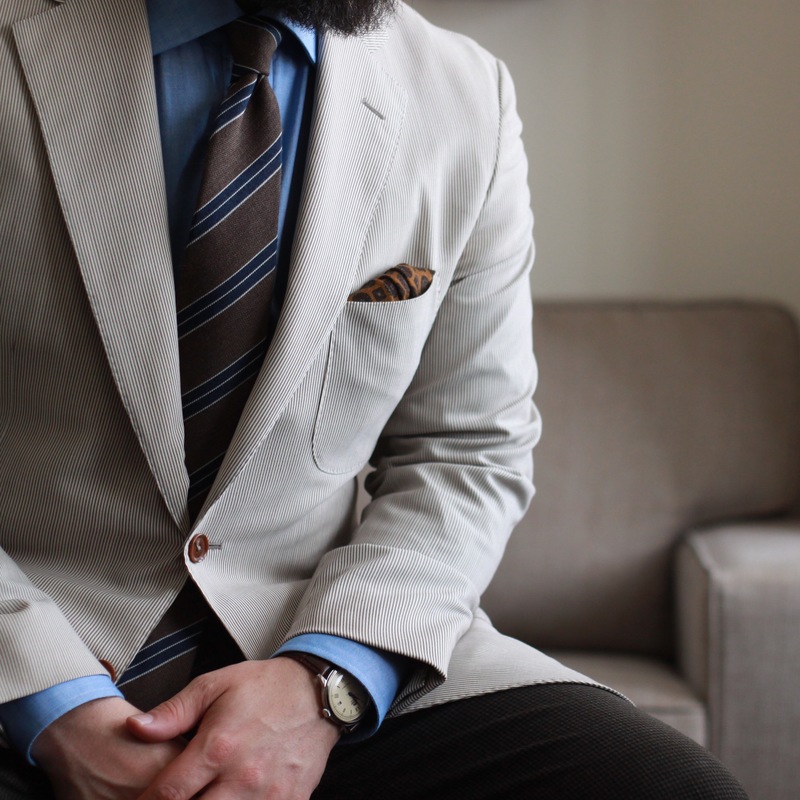 To me, this was an excellent combination of colours, lightness, and fabrics for a summer outfit. 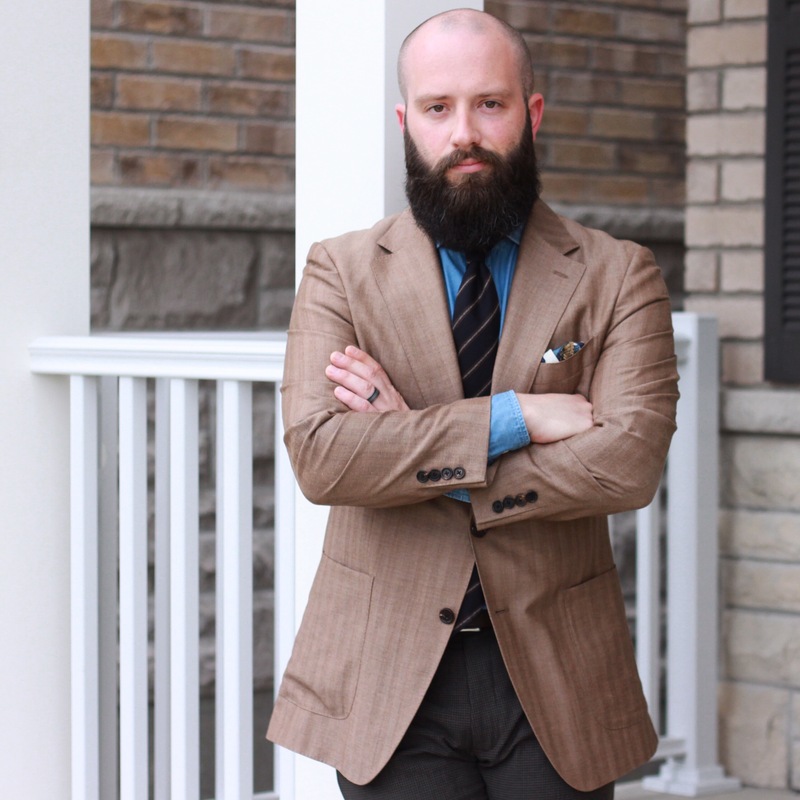 This brown “slubby” jacket from Spier & Mackay is a new favourite. I wrote about it in my post about their Neapolitan cut. The fabric is awesome, and if you’ve followed along with me for a while, you know I enjoy textured solids. They still have some sizes available, if you head over to their website. I would highly recommend this one. Navy grenadine from Kent Wang balances out the texure of the jacket, and the light grey sharkskin trousers and light blue shirt provide some lighter tones. Pocket square is also from Kent Wang. Can you guess which one? Keeping it a little looser around the collar on a particularly hot day without a tie. Also, I sometimes struggle with finding ties to pair with this jacket in my current collection. I approached this one thinking of what would work with jeans, then swapped them out for the navy trousers. This was a great casual look, and it lets the jacket do all the heavy visual work. No tie again. See what I mean? 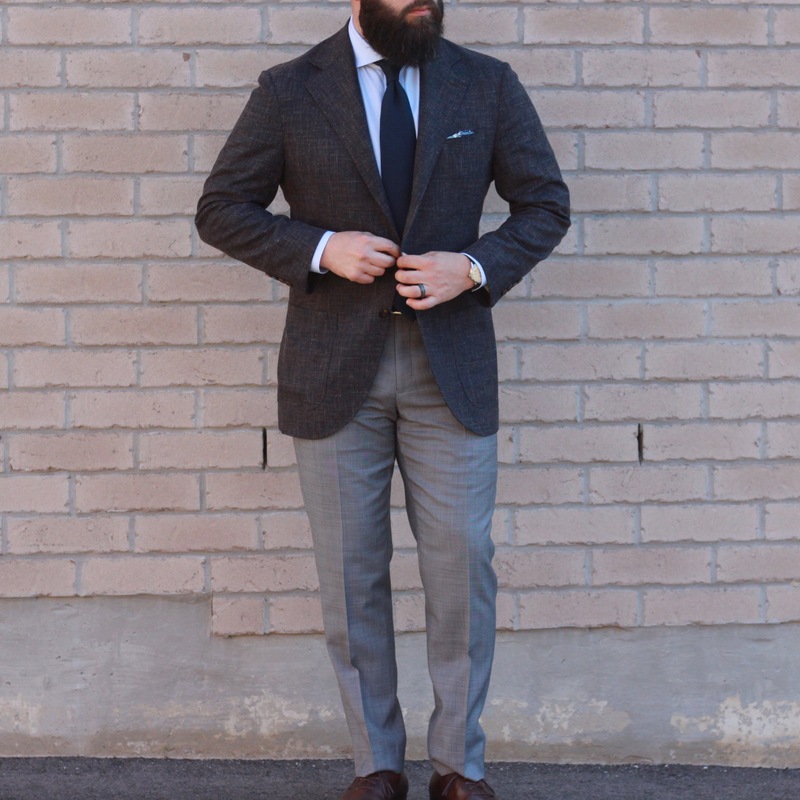 Keeping it light with grey and tan over a pale blue shirt. I wanted to share the shot of the lower half for a couple of reasons. One, look at that crease! Hot damn! Two, check out the loafers! 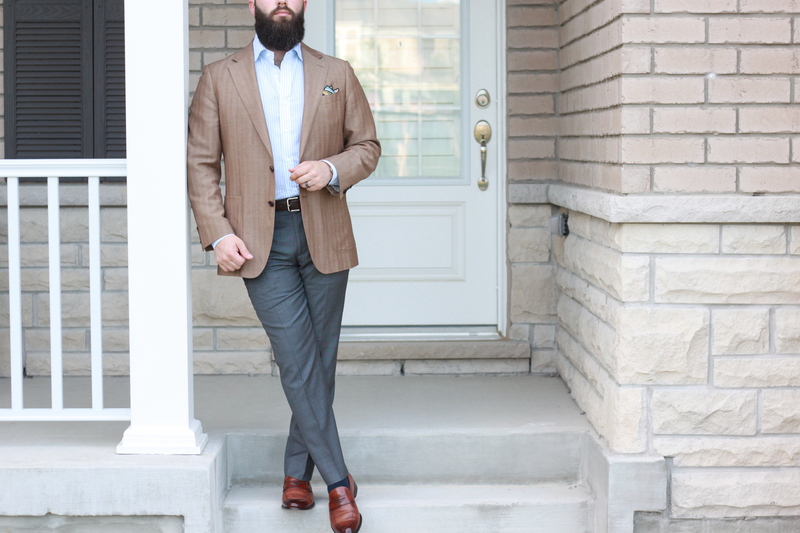 Paul Evans in Havana Brown. I have completed the review now. Spoiler – I’m really happy with them! Another hot day sans tie. I actually bought this shirt when I was picking up this jacket, and the combination of the two really pushed me to buy it. Worn here with my cream cotton-linen pants. I chose my St. George and the Dragon pocket square from Rampley & Co, as the blues, greens and creams in the art would work well in the context of the jacket, shirt and trousers. Well, it’s going to be a shorter month of content as I’ve recently returned from vacation. But I promise, you’ll see it in early September… not the middle of October. Hope you’re all enjoying your summers!